Yup. There have been cyclical variations since then - the early-mid 90's kind of sucked for industrial hiring so lots of my peers did one or more postdocs before going into industry. But overall the prospects have been getting steadily worse. I'm probably being too cynical, but is it a bad sign that of the 9 "tips", all of which I do believe were provide genuinely, only 2 are from ACS members with actual jobs in industry? Oddly, none of the advice was from middle aged white men. 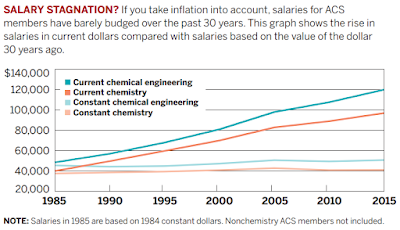 Maybe an underrepresented class of chemist? MSc and PhD students who clearly aren't jaded... yet! But I think Daniel Robbins advice at the end saves the day. As they say, 'that's the "c'est la vie"'. Nothing wrong with computer programming. Over 40 years ago, I was looking for my first job. Got one doing scientific programming (civil service) in the Dept of Defense. Got three years of experience under my belt and went into industry. I'm still working at my industry job, same company (3 mergers so far). In a couple of weeks, I'll celebrate 38 years with them. I still enjoy reading about chemistry, but I don't regret leaving it either. 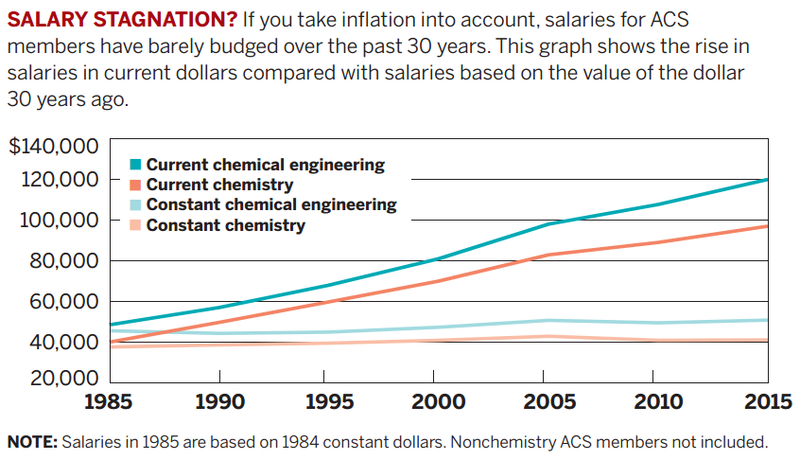 Assuming the median length of a Ph.D. in chemistry (5.9-6.3 years, IIRC), I think that's quite an opportunity cost. But yes, I agree, nothing wrong with computer programming. Opportunity cost vs sunk cost.. STEM shortage! STEM shortage! STEM shortage! The numbers are deceptive. I got into a discussion with someone who works at the ACS and points to the low unemployment rate as an indication that the difficulties are overblown. Proving that there are lies, damned lies, and statistics. That one number conceals far more than it reveals between selection bias, underemployment, employment outside chemistry, etc. Furthermore the relatively stagnant wage growth would indicate at best a sort of equilibrium has been reached where enough people are exiting the field to prevent wages from sliding. It's surely not an indication of rosy job prospects. It would be interesting to look at data for other fields as well. The prospects in this field are terrible and I am awaiting the day where I can leave this field and do something else.